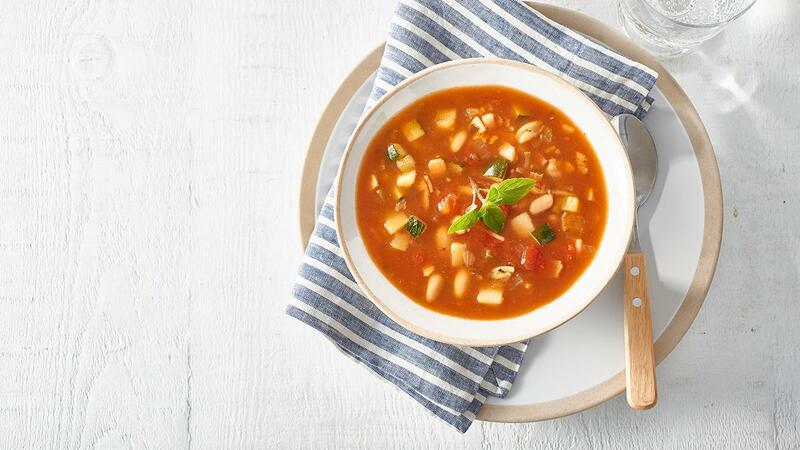 A classic Italian soup, that is packed with flavour and texture of seasonal vegetables for a filling and delicious meal. Heat oil in a large saucepan. Add bacon, garlic, leek, potato, zucchini and cook for 4-5 minutes stirring regularly. Stir in water and CONTINENTAL Professional Gluten Free Minestrone Soup Mix and bring to the boil. Add cannellini beans and KNORR Pronto Napoli and simmer for 10-15 minutes or until vegetables are tender. Serve soup garnished with oregano. Use any spare in season vegetables to bulk out the soup and garnish with grated parmesan cheese and fresh oregano.